The spirits industry is known for being somewhat male dominated. Whilst Masterblenders and Distillers are no longer solely silvering men, the fact that a 28-year-old female chemist has been bringing her own brand of classic gin to the cobbled streets of Durham is still an slightly exciting oddity. Sated catches up with Head Distiller of Durham Distillery, Jess Tomlinson, to find out more about her and Durham Gin. I did a Masters in Chemistry in Edinburgh and love science but I am also quite artistic and creative. I enjoy baking and cooking so distilling seemed to match both science and my love flavours. I completed my Masters in Brewing and Distilling and have never looked back! Gin in particular combines delicate flavours and there is a real passion in the industry for the distilling side of things. There are an infinite number of permutations of botanicals, which can be used to produce some wonderfully distinct, yet classic gins are what really excite me. What brought you to Durham Gin? I am from the North East and wanted to stay within the area. 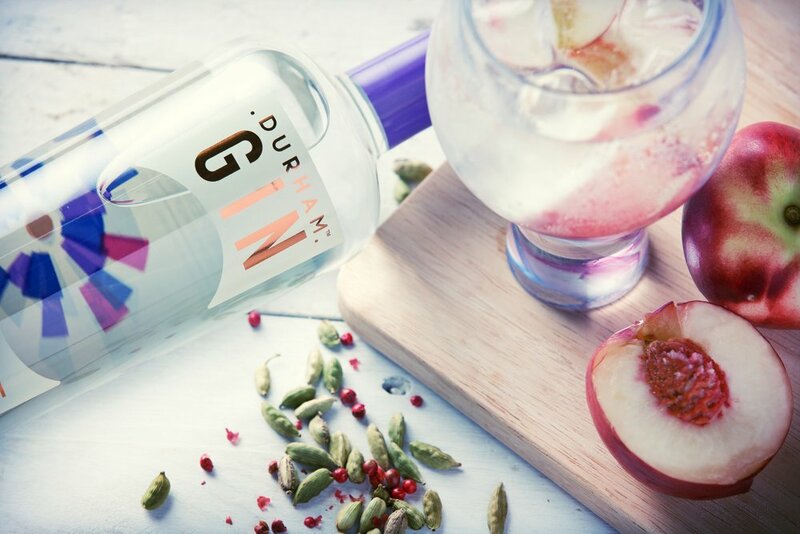 Durham Gin was really attractive for this reason but also the idea of being involved in a small business from the beginning really helped cemented my desire to join. I’m really interested in Durham as a city (and of course the North East as a whole); we create jobs for the area, tourism and something for people to be proud of. Talk us through the methodology of distilling at Durham. Durham Gin begins 24-hours before distilling, using a process called maceration. This is where some base botanicals are soaked in alcohol and spring water from County Durham, which is delivered to us from a local well source. Once macerated, an extra set of botanicals is added and the still is turned on. We also place more delicate botanicals in a gin basket; this allows from vapour infusion, which is a much softer way of introducing flavour to the gin. We use a traditional old-fashioned worm tub to cool our hot vapour down to a cold liquid. The ‘run’, as it is called, is then split into three parts: the Heads, the Hearts and the Tails. These are determined by taste and smell alone. The only tech kit we use is a digital hydrometer; this determines the final percentage alcohol of the spirit, essential for ensuring the spirit is the 40% ABV advertised. Once produce,d only water is added to produce our London Dry Gin. We use ten botanicals in total: juniper; pink peppercorn for warm spice; celery seed for savoury notes; elderflower for sweeter floral notes; along with angelica, coriander, orris root, lemon, orange and cardamom. I like to think of flavour profiling like an iceberg: you have some predominant flavours at the top with the ‘others’ as the base, without which everything would fall apart. What was the idea behind Durham Gin? We wanted to create a distinctive but classic gin. Gin should have the predominate flavour of juniper, otherwise it is not gin, it’s flavoured vodka. We wanted something that used some classic British flavours like elderflower, angelica and celery seed, that could be matched with some more exotic flavours, such as pink pepper, cardamom and coriander. Our gins flavour profile is spicy, sweet and savoury. We didn’t want to make a gin with juniper that had a bit of citrus, which is what a lot of gins tend to be. The branding is quite unusual. Would you be able to tell us a little about that? Durham Gin is all about transparency. You can come and see the still and we will show you the process; everything we do is done properly with real thought and care. For example, our Strawberry and Pink Pepper Liqueur only use fresh strawberry juice with no artificial sweeteners, colours or preservatives. It is completely natural. This is the reason for the clear bottle. The ’roundel’, as we refer to it, is a modern take on the Rose window at Durham Cathedral. We were established in 2013 and don’t pretend to be something we’re not. We’re a modern company working with our beautiful surroundings in a city steeped in history. We wanted to pay homage to this in the bottle’s design. We have some very, very exciting plans for the future, which include the expansion of our premises, taking on more staff, and increasing our range as well as our stockists. We have several announcements going out over the next couple of months so watch this space! Pink peppercorn gives a tongue-tipped spice and waft of warmth, permeated by celery seed’s savoury character. The end note is one of floral sweetness from the elderflower . Perfectly chilled in a 2:1 tonic to gin ratio, with a good quality mixer such as Fever-Tree or Fentiman’s. Garnish is unnecessary but the versatility of the gin offers the opportunity to be playful. Try it with rosemary, cucumber, pink grapefruit or strawberries, for something a little different. Durham Gin, 70cl – £27.50. Buy it here.